The National Football League has been given the proverbial BOOT. Traditionally the new years NFL draft is held on the final weekend of April. For the 2014 season it has been punted backward two weeks to May 8th thru 10th. As it turns out the loss of field position (for the most part) is due to kickers not yet in the league. The ROCKETTES kicked in the door of Radio City Music Hall in order to schedule a show called "Hearts and Lights" to run from March 27 through May 4. The forceful entry resulted in the Tutu wearing NFL's foot-wedge from behind a bush. Seeing that The Miami Dolphins drafted their long term kicker Caleb Sturgis in 2013, and without further adieu with (28 days to go) until draft day. Here are a few prospects that The Miami Dolphins might high-kick to the tops of their boards. Which position and or player would you draft (if available) at Miami's pick number 19? UCLA Guard Xavier Su'A-Filo is a 23 year old Junior, and a 6-4, 307 pound offensive lineman that has started all 40 of his tenured UCLA Bruin games. As a 2009 freshman he started all 13 games at Left Tackle. Upon his return from a two year (2010/11) Mormon Mission, Xavier started all 14 games at Left Guard in 2012. He started 6 games at Left Tackle, and 7 games at Left Guard in 2013. Su'A-Filo has the power and athleticism to play in any type of blocking scheme, and possesses a tireless work ethic while also being of high character. Though he was not his best at left tackle, he projects to be an immediate starter and very good NFL Guard while he could potentially play some Tackle. Alabama Inside Line Backer C.J. Mosley is 21, stands at 6-2, 234 but plays bigger than he is while offering an outstanding linebacker 40 yard dash of 4.63. CJ has played in 51 of a possible 53 games with 31 starts in four years while at the SEC's Two Time (during his career) National Champion Alabama Crimson Tide. He had 3 starts as a 2010 freshman while playing in all 13 games. Mosley missed his only two career games in 2011 with a dislocated elbow while playing in all eleven other games, and started six times. He had ten starts in 14 games played for the 2012 season. CJ's 2013 Senior season included all 13 as the starter while winning both of the Nations (Butkus & Bednarik) trophies awarded to the Top Line Backer, and the Top Defensive player. Mosley is good in pass coverage too with five interceptions of which three were taken to the house over his career. It has been a long time since a guy with C.J.Mosley's sort of instinctive anticipation, fluid sideline to sideline pursuit, and pure tackling ability has roamed the Middle Line Backer position for the Miami Dolphins. 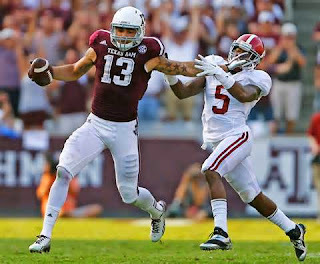 Texas A&M Wide Receiver Mike Evans is a 20 year old at an eye popping 6-5, 231, and long strides a 4.53 forty. He red shirted in 2011, but started all thirteen games of his Freshman 2012 season while tabulating 82 catches for 1,105 yards and five touchdowns. As a 2013 Sophomore, Team Captain Evans blistered the SEC with 1,322 yards on 65 receptions, and 12 touchdowns. Included was a dismantling of Alabama with seven receptions for 279 yards, and then again a few weeks later with 287 yards on 11 catches against Auburn. Mike has excellent speed for a receiver of his size, he actually plays faster than his 4.53 might suggest while even being able to get over the top if so desired. He is an exceptionally tough/strong receiver that simply overpowers most defenders, Evans can leap with the best of them, and has great sticky-fingered hands. Evans is the reason that Johnny (Football) Manziel is the commodity that he is cracked up to be! Though it is more than likely to require a drastic move up from 19 to get him. Mike Evans as a true number one type of NFL receiver would be the perfect complement to a Mike Wallace type. North Carolina Tight End Eric Ebron (21 on Thursday) is a Junior Underclassman that comes to the NFL standing at 6-4, 250 and covers forty yards in 4.60 seconds. Over his three year Tar Heel career the Tight End has gathered 112 receptions, 1805 yards, and eight touchdowns. As a 2011 Freshman he had ten catches for 207 yards with one touchdown in ten appearances. Ebron caught forty balls for 625, and four touchdowns in eleven games as the starter in 2012. The 625 receiving yards stood as the third most by a tight end in ACC history. 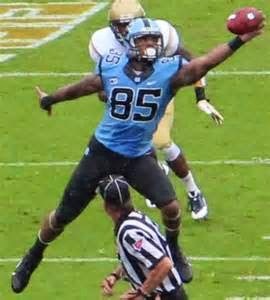 2013's Eric Ebron produced an ACC tight end record (791 Vernon Davis) breaking yard total of 973 yards on sixty two receptions with three touchdowns. Eric's career best in yardage game came on a Nationally televised Thursday Night with The Miami Hurricanes when he had 199 yards on eight reception's and a 71 yard touchdown. His single game career high for catches is nine, and his longest career reception covered 79 yards. Ebron is fast for a 250 pound kid, he is also quick off the line of scrimmage, out of his breaks, and can juke folks out of their cleats in the open field. Eric can also break tackles as a strong runner with upper body strength to boot as displayed in his twenty five bench press repetitions of 225 pounds. He is a powerful blocker when called upon, but make no mistake, he is a play making, receiving type of tight end. Oh Yea. He has great hands too with a huge, agile catching radius while always playing with great awareness, and extreme confidence. At a current level that is no where near his potential ceiling, Ebron is head and shoulders more talented than the next best tight end in the 2014 draft. Eric Ebron (similarly to Mike Evans) would be the perfect complement to The Miami Dolphins receiving corps (especially Wallace), but to get him. it may require a minor jump up from the Dolphins current draft spot. Alabama Free Safety Hasean Clinton-Dix (21 and Affectionately referred to by all since early childhood as ""Ha-Ha"") comes to the NFL as a 6-1, 208, 4.58 in the forty Junior. He has twenty one starts in thirty eight games played for a very good collegiate head Coach in Nick Saban. 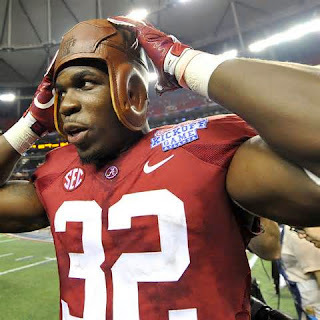 During his initial season for Alabama's Crimson Tide,(though for the most part on special teams)he played in all 13 games, which is quite the feat in itself as a Freshman for the well stocked 2011 National Champions. ""Ha-Ha"" started Ten of Fourteen games for the Back To Back National Champions of 2012, and he led the entire SEC for interceptions with five. 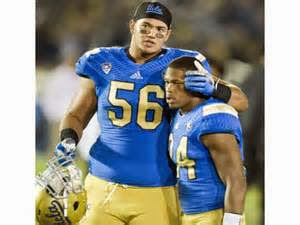 In the Championship game versus Notre Dame he was second on the team in tackles behind only the above spotlighted (C.J. Mosley) while recording and interception in his third consecutive game. Clinton-Dix played in only eleven 2013 games due to a two game (undisclosed) team violation suspension. He was immediately reinstated to the starters position, had two interceptions with 52 tackles on the season, was an All-SEC First Team selection as a Consensus All American for the year. 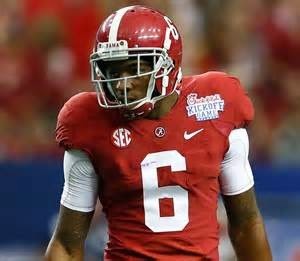 Hasean Clinton-Dix possesses quite the combination of size, physicality, speed, ball skills, athleticism, and knowledge. ""Ha-Ha"" displays good football knowledge in his ability to read and react decisively to the run or pass while being a very physical player that makes folks remember his number. Clinton-Dix is a fluid athlete with the ability to cover any route, has good recovery speed, is an astute jumper, and is agile with great ball skills. Notre Dame Tackle Zack Martin (23) has short arms! But then again, so did T-Rexx! At 6-4, 308, "Zack" has started (a team record 52 consecutive games) at Tackle for The Irish. No need to break it down individually. (52 games equates to four years times 13 games started at Tackle). He has started the last 50 from the Left Tackle position and has been the team offensive lineman of the year over the entire duration of his collegiate career with the most recent 26 games as Team Captain. His two Right tackle starts were in his initial 2010 season and he started the remaining eleven at Left Tackle. The quarterback's backside hit the ground 20 times, (the fewest Irish sacks allowed since 1998). He was named the Johnny Rogers Most Valuable Offensive Lineman after their Bowl game win. 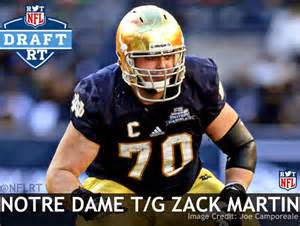 For 2011 Zack was the leader of an offensive line that allowed just 17 sacks, while averaging 4.8 yards per rush attempt, (best by a Notre Dame team since 1996). His unit allowed just eight sacks in 2013, and he was named the MVP for Notre Dames Victorious Bowl game. Zack Martin obviously has a plethora of the required intangibles as well as the all around offensive lineman skills to play either tackle, or guard position, and he would most definitely be a day one starter somewhere! He has those 50 Left Tackle starts, so he would also be the only guy other than Brandon Albert that can play Left tackle, and having a capable second emergency Left Tackle is an absolute necessity! Meanwhile, he can potentially be groomed into the eventual starting Left Tackle, T-Rex arms and all. If he is available, and if he were to be chosen with The Miami Dolphins First Round Draft Pick Number Nineteen? OTHER Positions and/or Players that you personally might like in the first round? Of course, their are other higher ranked, higher profiled prospects at practically every position already mentioned. To name a few, they are (OT's Jake Matthews, Greg Robinson, Taylor Lewan, OLB's Khalil Mack, Anthony Barr, and WR Sammy Watkins). However. Those players are extremely unlikely to fall to pick 19, and would require a trade-up option, as may a photographed few. Their are also positions/players not mentioned that would be excellent though unnecessary additions. A late scratch from the above possibilities list were Corner Backs Justin Gilbert, and Darqueze Dennard. Defensive Tackles are plentiful too, as well as are other similarly ranked to the above photographed offensive lineman, but at some point you just have to punt. You are The Miami Dolphin General Manager. Who do you prefer if all are available, and who do you think becomes the Dolphins actual first round pick at number 19? Who are your Second (pick 50), Third (81), and later rounds (116, 155, 190, and 234th) pick favorites? Which "KICKER" do you prefer? Thank You for an Open Minded Read, and we look forward to your angle of view!